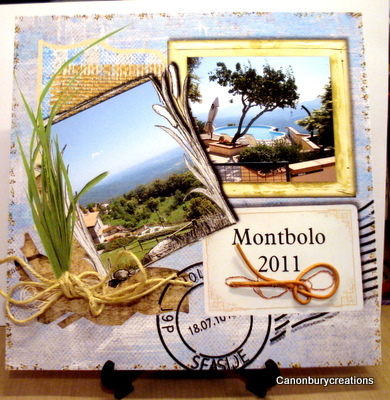 Gill's challenge was to create a scrapbook page or mini album of a holiday that you have already had or a place you wish to go to. We had a lovely holiday last month in Rousillion half way up a mountain in the foothills of the Pyrenees so I thought I'd go for that. Scrapbooking is not a craft I have much experience in except for using a digital package(Craft Artist) which I love, as it allows you to play around with all the embellishments before deciding on the finished look. I set the page for 8" x 8" so that it prints out easily. When we opened our bedroom doors every morning the view of the pool was what we saw, brilliant eh? So here is my finished result and embellished with a bit of string! !